Thanks to my wonderful guest writer on Monday while my Internet was down. He’s way more in depth than I am. Before we begin a series of articles on vengeful beat downs, I thought we should take a moment to glimpse into the brain of Wolverine. Literally. 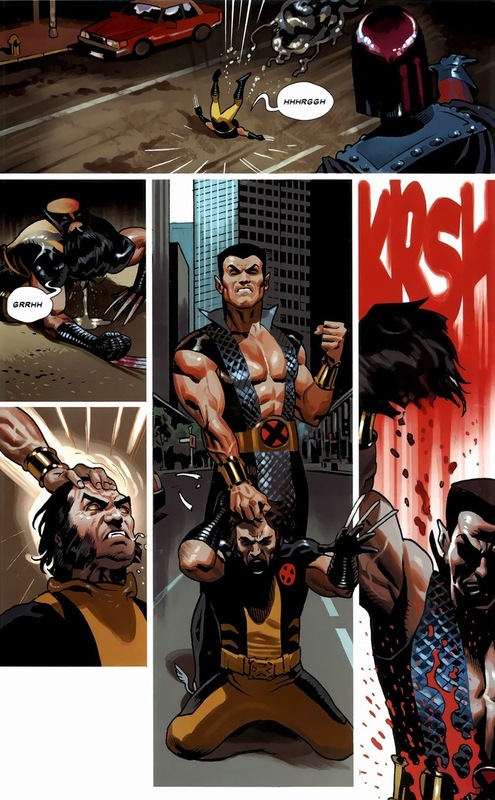 Though I want to take a second to give proof that Wolverine’s not invincible. Yes, he’s crazy hard to kill. And yeah, he does heal from most major injuries within seconds. But you can totally take him down! I mean, you and a highly skilled team of specialists working perfectly in sync. Step 1: Remove the unbreakable adamantium from his skeleton. Step 2: Remove his head. Step 3: Incinerate the leftovers. Not so bad, right? 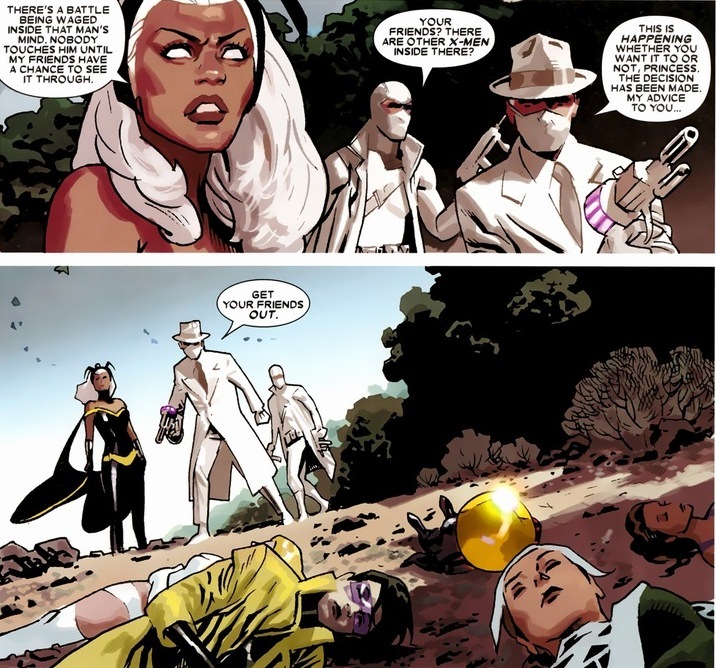 If you don’t happen to have Magneto, Namor, and Cyclops lying around, there are other methods. How about something a bit more scientific? 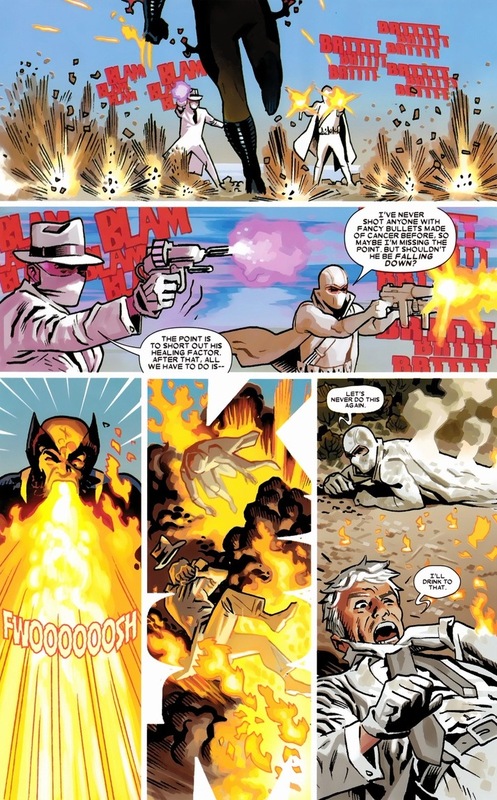 Though to be fair, fire breath isn’t exactly listed on Wolverine’s dossier during the mission briefing. Which brings me to the whole mind tapping in the first place. Logan’s possessed by a demon. 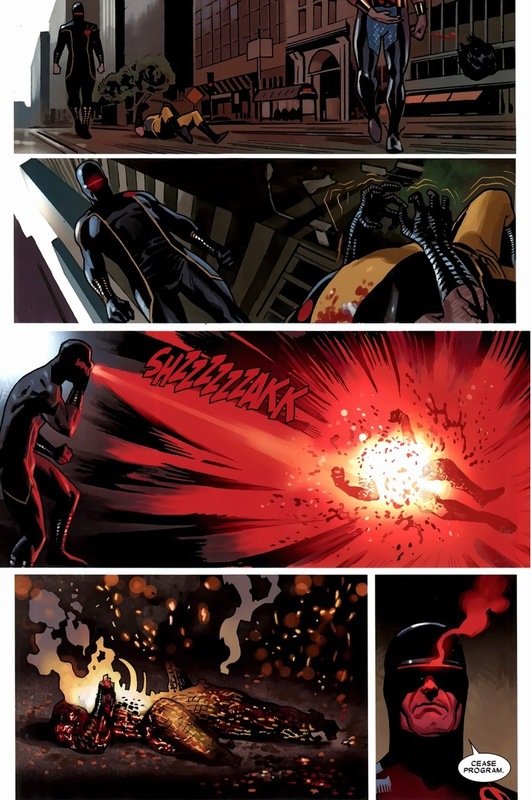 While a team fights the demon-Wolverine, another team infiltrates his brain to stamp out this whole demon invasion. Sounds simple enough. 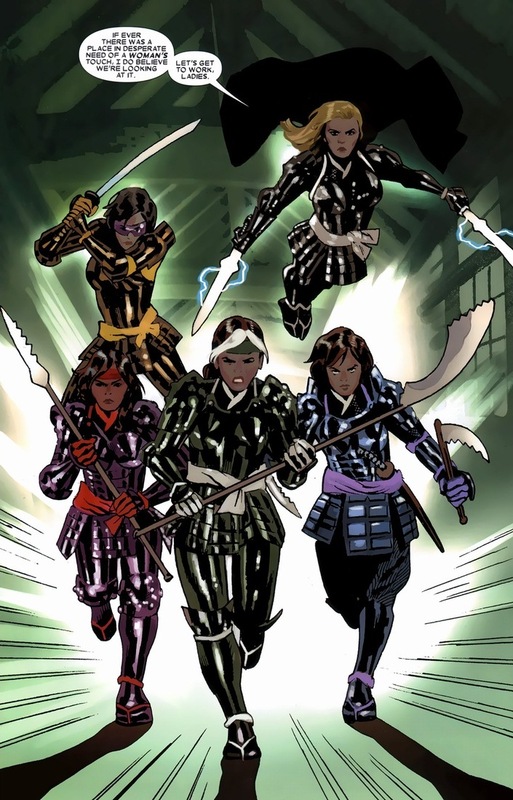 Why are they wearing samurai outfits? I don’t know either. I guess when you’re psychic manifestations in the inner sanctum of a man’s memories, you can wear whatever you feel like. 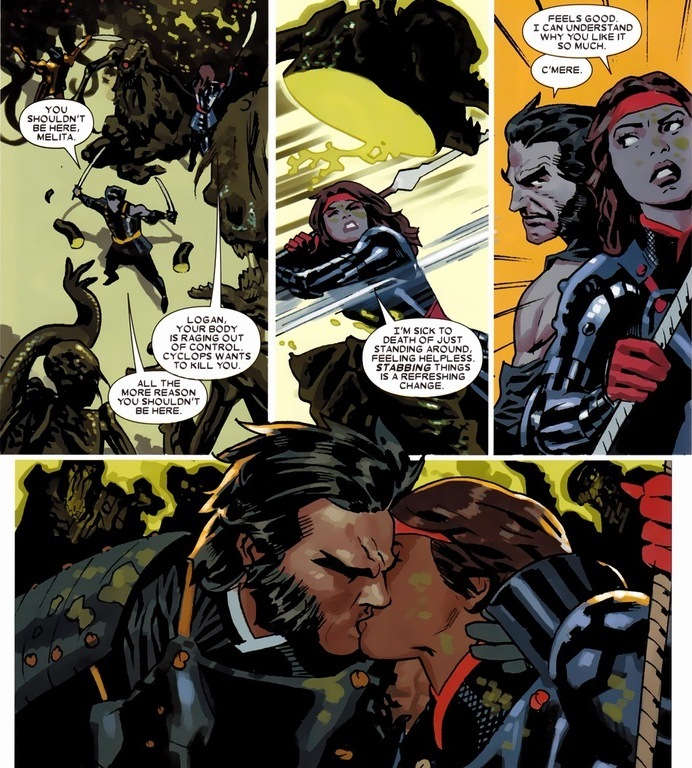 As usual, a few convenient explosions both inside and outside Wolverine’s mind separates him and the ladies. And you should be thankful it does, because we get to witness the true secrets of Marvel’s hairiest superhero. It goes exactly as you think. 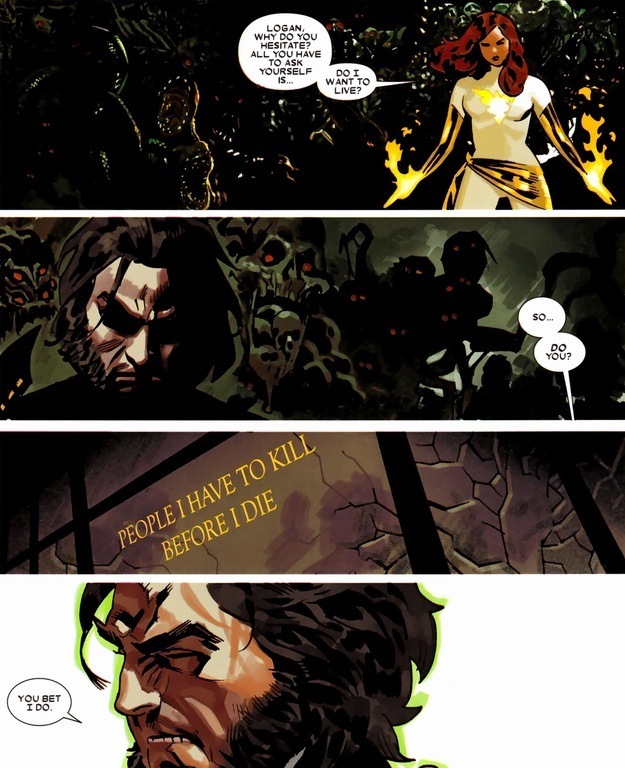 With the fate of his life hanging in the balance, Wolverine has to make a choice. 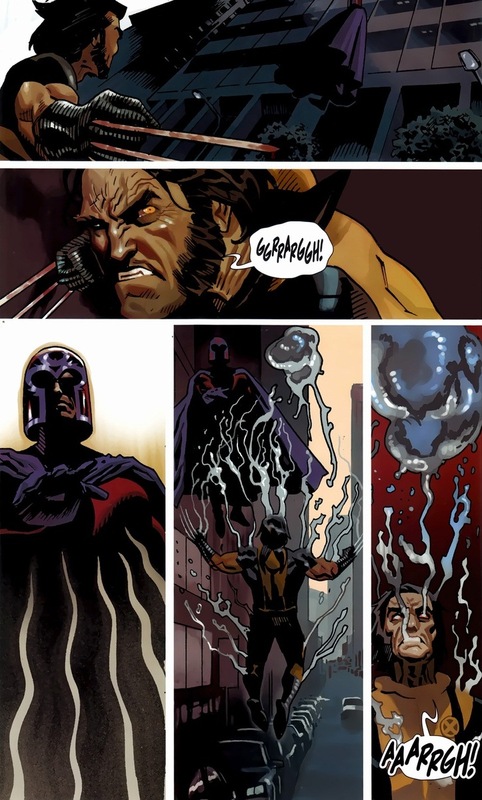 Being practically immortal, Wolverine is gifted with a rare chance to die by Cyclops’ hand. If he stays alive, he knows he’ll no doubt have to endure enormous trauma, suffering, and tragedy for centuries to come. What’ll it be? 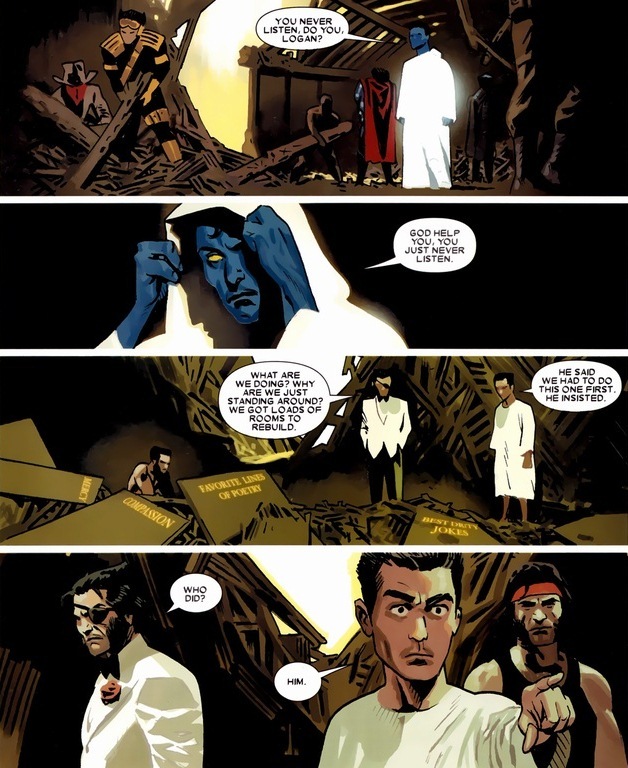 Now, Wolverine’s not meant to be a sympathetic character. He certainly had his fair share of horrible stuff happen to him — definitely more than the average superhero — but he’s meant to be imperfect and complex. 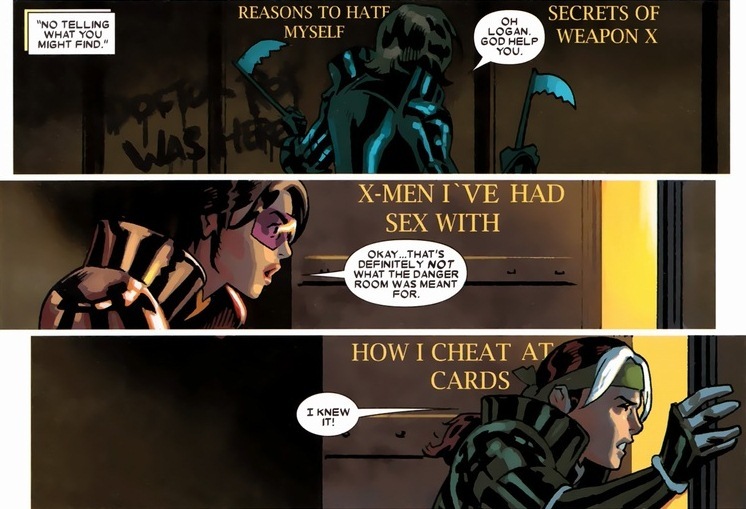 Fantastic character development has made him the most popular X-Men since the 1980s. Even with that hair style. Plus, I don’t think there’s any superhero out there that takes the severity and volume of pain this man does. 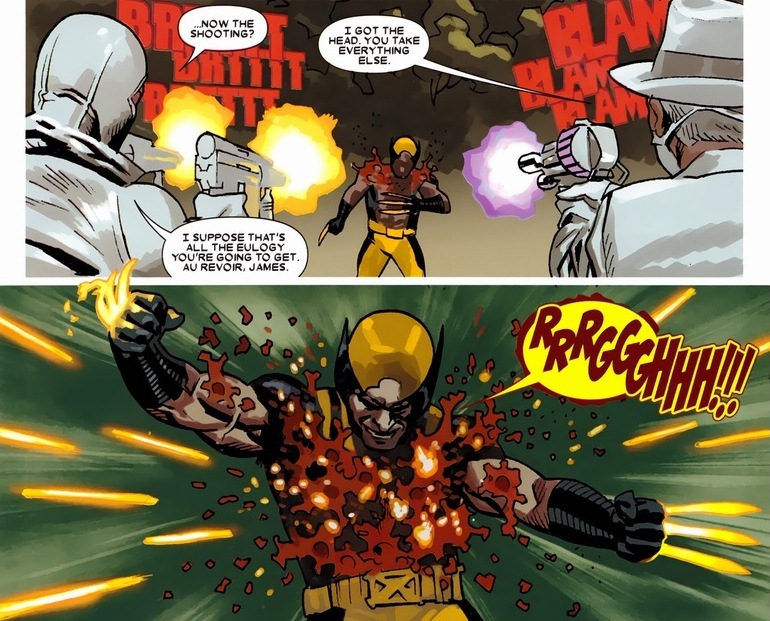 Go find me any issue with Wolverine where he doesn’t get punched, stabbed, shot, burned, electrocuted, or blown up at least once. Good luck. 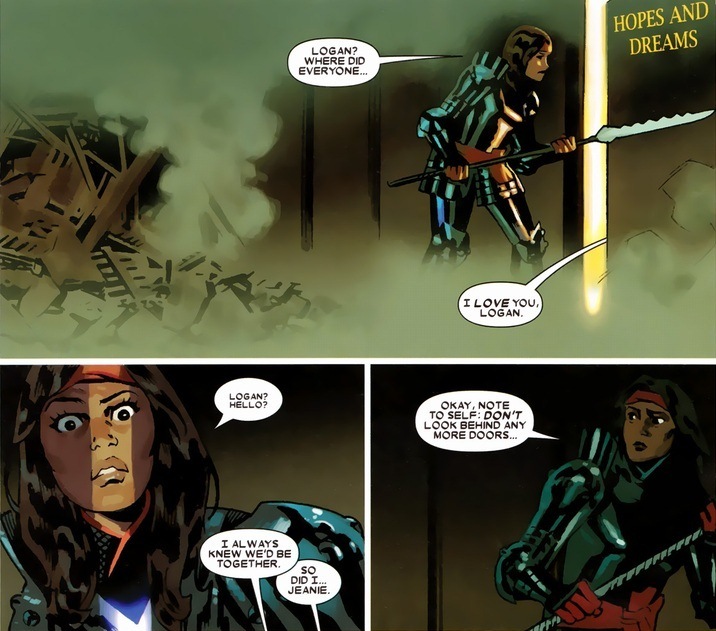 On a side note, I totally get the absurdity of superheroes. Look, I’m not any sort of professor or literary critic. I’m just a fan. But superheroes have existed for over 70 years, and most have really silly names. Why have they endured and what purpose do they serve society? I don’t dwell on that — I just like stories. Good stories. Oh, we’ll get to that. 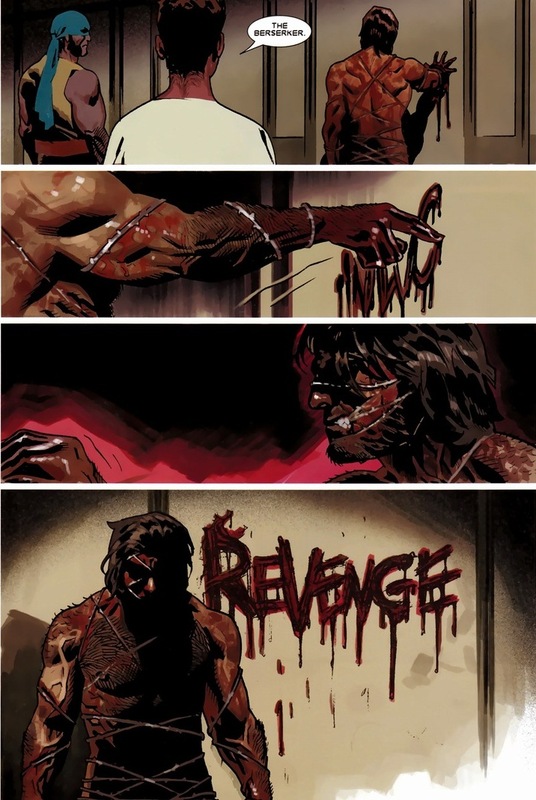 You don’t send Wolverine to Hell and get away with it.